This post, is to say thanks for a little freebie I scored a few weeks ago. This small - super cute bag, was a giveaway by the green brains behind green LA girl. It arrived in, of course, in a re-purposed envelope. Awesome! It's a pretty cool bag Act2 GreenSmart made out of old plastic bottles and has many practical pockets. I carry an extra tube, multi-tool, IDs & lipstick when I don't feel like taking a purse. Sling it across & stick a secondary rear blinky because it gets dark VERY early. I've also used it to stash my bike holiday lights-set that go on my basket (pics to come soon). So functional. ♼Thanks Siel! Stable is a rather new cafe in the Mission. I've enjoy this place plenty. My favorite part is the view from their upstairs area, the messenger service nextdoor (godspeed) and the use of the local De La Paz coffee (also located in the Mission). The atmosphere is super chill, I have yet to see a laptop and the staff is always very nice. Bikes will take you where cars won't (at least not yet). This is in the Mission Bay area. What can bike do for you? This Holiday season, UPS is jumping on the bike saddle and delivering by bike. via bikeportland.org / UPS is looking to hire bike delivery people in Vancouver (WA), Portland, Salem, Corvallis, Eugene, and Medford. UPS started delivering by bike in Seattle (where they were founded) over 100 years ago. Today, the company once again uses bikes for deliveries up in Seattle and Grant said it went so well they’ve decided to expand the program. Rumor had it that the Peet's location at the Ferry building had a discount for bike riders. I know they do offer 10¢ off when you bring your own mug, but so do many local coffee shops around the city, which is nice. Heading to work is always a different sky scenery. This was a nice morning welcome. A massive man-made structure in junction with the foggy nature. Some mornings I'm just in love with the sky. 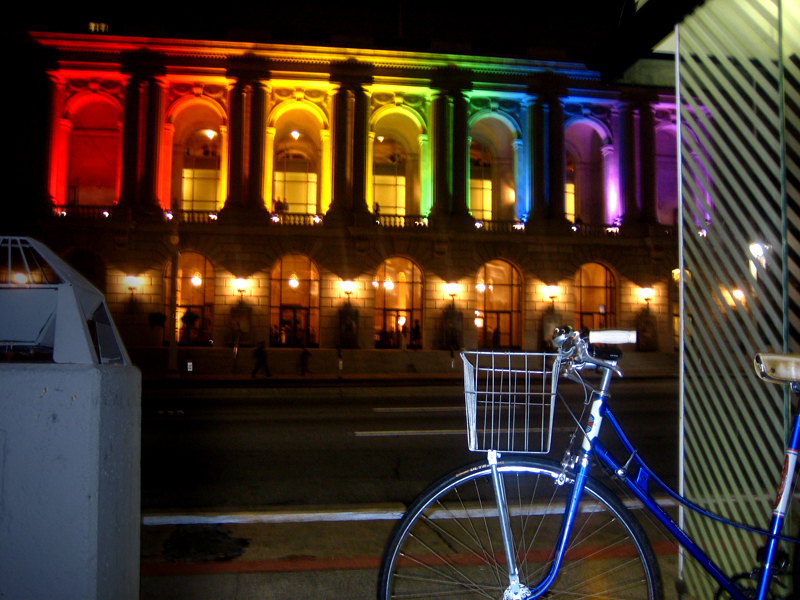 ‹Wednesday night› In front of the Civic Center, the War Memorial Opera House showed some support. ♥Ride on! The SF Bicycle Coalition had a Volunteer Appreciation Night this past Wednesday at the Make Out Room. Bikes, volunteers, drinks and prizes. It was nice to see riders that I've volunteered with throughout the years, meet new coalition staff and share a drink with fellow bike lovers. This was a nice gesture from the SFBC, thanks!& also thanks also for the gift certificate I won in the raffle. My new stuff is stuff that goes on my bike. ...And what is she smiling at? 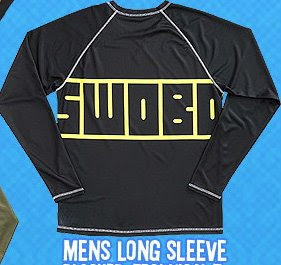 eew. Boo for kaango, such imperative sentences. Note to self: continue to support craig's list. Rock the Bike's Fossil Fool is organizing a rad ride not to be missed. Sunday, November 15th at 7PM. This weekend (nov 14-15-16) is the annual Green Festival. 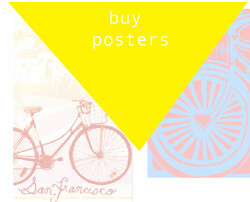 Arrive by bike & get a discount. 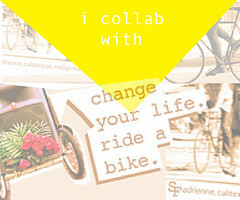 There will be of course, ♥valet bike parking by the SF Bike Coalition. The first issue I collected of Momentum was the issue that included the opening of Lance's Mellow Johnnys in the awesome city of Austin TX. Now MORE awesome, is the upcoming issue – Momentum Magazine: San Francisco!! 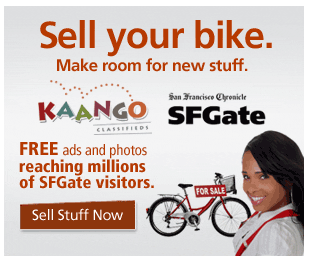 Im jumping on that subscription discount for SFBC members right now. (From this week's SFBikeCoalition newsletter) It has a San Francisco focus with a great story on SF bike culture, a profile on architect and SFBC Board member David Baker, and other 'SF cycling Agents of Change' including Dave Snyder (former SFBC Executive Director); Carla Laser (Founder of the SF Bicycle Ballet) and Jim Swanson (Pioneer of Critical Mass). SFBC members get a discounted subscription and Momentum Magazine donates $5 per subscription to the SFBC! Thanks Momentum!! I came across a new print by Evan Hecox. 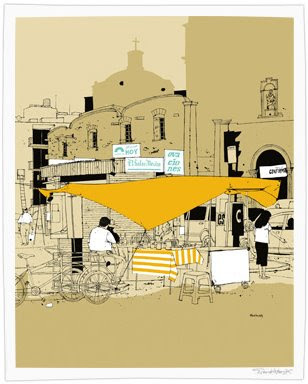 Often, his screen prints have the power to bring back memories of personal travels & wonders. El Sol De Mexico reminded me of this sweet corn and crepes vendor I met, down in southern Mexico sometime ago. Enjoy!